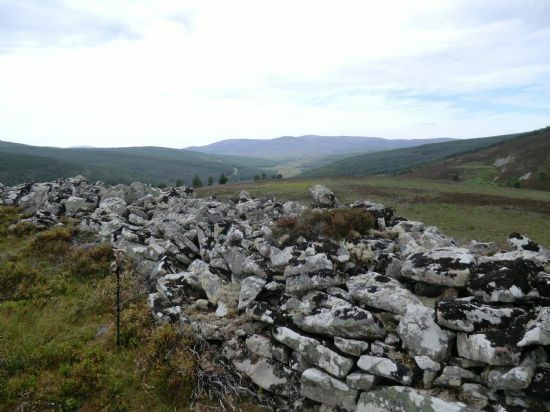 The section of the routeway running from Rosskeen to Balnagown was examined by the community of Milton and participants from all along the route. 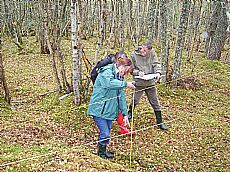 We were looking for remains of the routeway or sites that might have been associated with the routeway through the periods of its use. 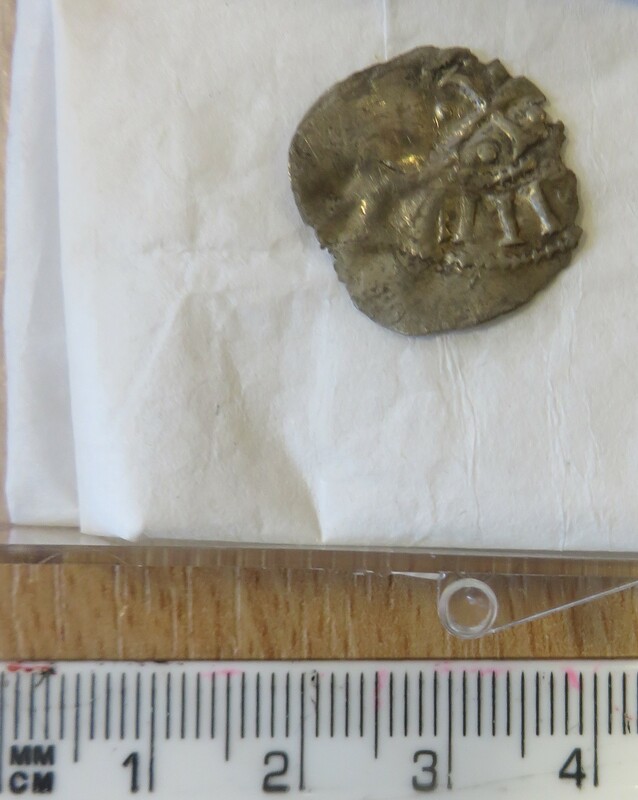 From the research done so far it looks possible that this feature may be medieval or earlier in origin but more work needs to take place before this can be confirmed. 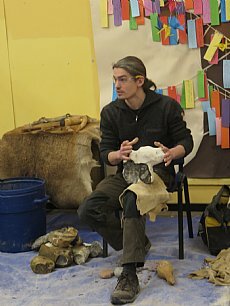 There is a rich prehistorical archaeological landscape in and around the Milton area. A particularly dense concentration of Neolithic – Iron Age sites can be found from East Lamington up the glen to Scotsburn and beyond into Strathrory. 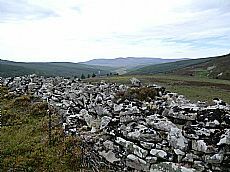 These include many Neolithic and Bronze Age chambered cairns and long cairns as well as a possible henge monument at Scotsburn. The site of Cnoc an Duin hillfort (MHG8188) and Scotsburn dun demonstrate an Iron Age society active in the area. At the fort at Cnoc an Duin you can still see the remains of defensive walling on two sides. This walling does not continue all the way around the fort, perhaps because the other sides are steep so naturally very defensive. The prehistoric sites in this glen are likely linked by old natural routes through the base of the glen. The dense evidence of prehistoric sites shows it would have been an active place from early times. An old drove road preserves the line of what is likely to have been an earlier route through Strathrory over to the Struie. The route runs from here past Scotsburn and East Lamington down to Milton and the tryst at Kildary. Here the cattle could have been sold at the market or ‘mercat’ in Milton or loaded onto the train for a journey south. 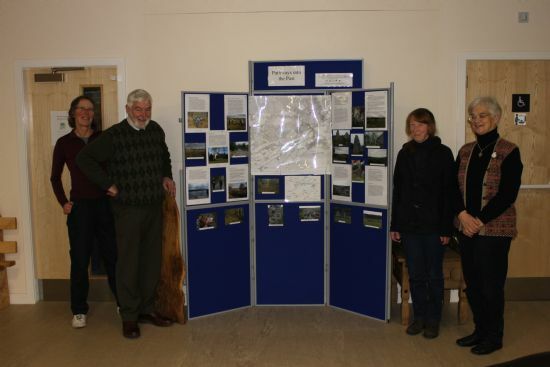 The Parish Churches of Logie Easter were also investigated. The original parish church was at Marybank (MHG8624). A ruin with one gable wall still standing exists today within a graveyard with a few visible gravestones. Most of the remaining gravestones are covered over with turf to protect them but some of the inscriptions were still legible when ARCH participants went to visit them. This church is likely to have pre-Reformation elements and went out of use in c.1760 when the heather thatched roof is rumoured to have burnt down. The site of the parish church then moved to another ‘Marybank’ church at White Lodge (MHG8720) built in 1767. (Other churches that have subsequently become the parish church include, Cill Mhoir, Mary’s Church in Parish of Kilmuir Easter and Pitmaduthy, the site of a church where only the graveyard now remains). The graveyard at the original Marybank Church appears to have remained in use for some time. Both Marybank churches were linked by a Priest’s path that leads along the river to Balnagown Castle the main power centre in the area from early times. The current Balnagown Castle (MHG8726) is a substantial late medieval L-plan fortified tower house with 17th, 19th and 20th century modifications and extensions. The castle was historically the seat of Clan Ross and the Earls of Ross. 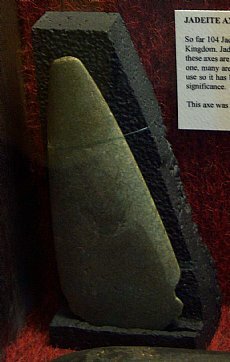 References to the Rosses of Balnagown go back in legend to the days of the Vikings in the early 11th century when the daughter of a Viking king was reputed to have wed the Earl of Ross. The castle sits on a natural raised bank above the river and about 2km from Nigg Bay. North of the castle are older river crossings: further upstream a ford and the 18-century bridge, known as the King James Bridge (MHG16663) (a fine high arched single span rubble bridge). 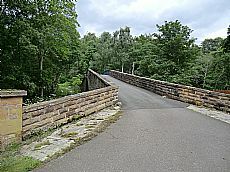 Below the castle are the modern river crossing points: the new concrete A9 road bridge, the older stone Telford road bridge and the rail bridge. Another power centre in the Milton section of the routeway is at Delny (MHG8608). According to the Rev John Matheson who wrote the excerpt of the Statistical Account for this area (1790) there was a principal seat at Delny, at one time, owned by the Earls of Ross, but no ruins were remaining then. In 1789, there was also a ruined pre-reformation chapel and graveyard, which were ploughed up by a local farmer – to add land to his cornfield and build houses for his farm-workers! The farmer was persuaded by the minister to collect the exposed bones of the graveyard corpses, rebury them, grass over the area and leave it sacrosanct. This church was also dedicated to St Mary – a popular dedication for churches and chapels in the area! Priesthill (MHG8602) is an interesting site near Delny, where a pre-Reformation manse and glebe have been documented. No obvious remains of these can be seen above the ground but some geophysics done by John Barber (GUARD) revealed a possible structure within a circular enclosure. Whether this represents a church with a typical pre-Reformation oval boundary wall remains to be seen. Delny and Priesthill was where the people paid their rents to the Earl of Ross on an annual basis. This was also the place where the barons held the court, in order to punish the local criminals. The men found guilty of criminal acts would be hanged about a mile from Delny on the Gallows Hill or Cnoc na croich (MHG39256) and the female criminals were drowned in a deep pool, the Poul a bhaidh (MHG39255), on top of the Gallows Hill. The 1790 statistical account mentions the recollection of a man who died in 1750. He recalls the last use of the pool for the execution of a woman convicted of child murder. Another drowning pool is thought to be located in the vicinity of Milton, now known as the laundry pool. 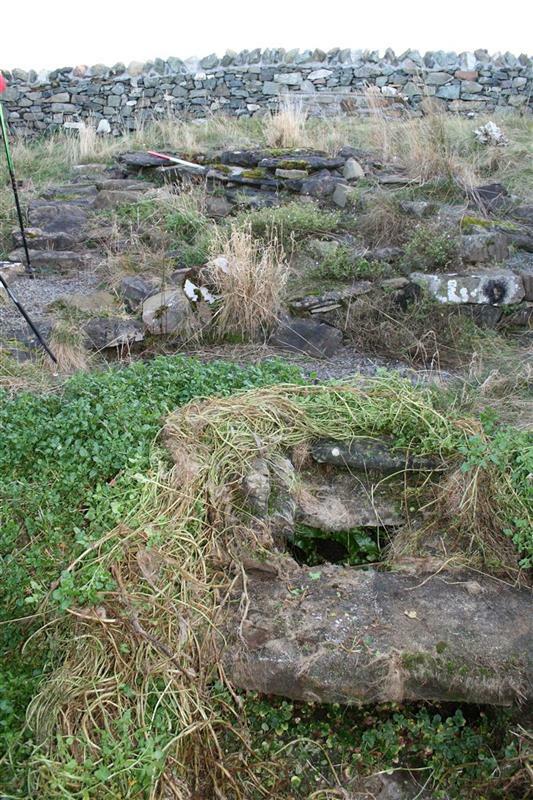 The pre-reformation manse and glebe were situated to the west of Priesthill, a St. John the Baptist’s Well (MHG8601) was located in the vicinity of the burn. Another part of the routeway, on Knockfarrel, also has a well dedicated to John the Baptist indicating religious connections along the route to Tain. 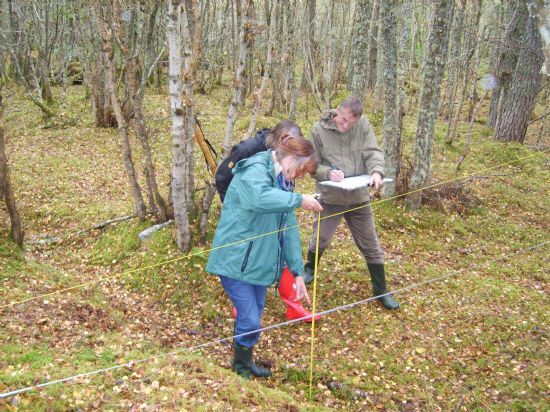 Double Embanked Features at Brenachie and Wester Teaninich were surveyed as part of the survey module of the course. Several profiles were taken across sections of the embanked features to provide a record and measured drawings of the site. These surveys allow us to compare different sections of double embanked possible road and interpret if the sections have been constructed and used in the same ways. Drawing a section of possible routeway at Brenachie. It is important to think of the route from Tarradale to Tain in its wider context – it is likely to have been part of a wider network of routes. Routes linking it with the higher ground and the west would have been important for trade and movement of people. Equally there would have been links from coastal routes and the east, particularly the Tarbat peninsula. The Nigg ferry crossing is well documented with references to use by King Robert the Bruce and King James IV. The ferry crossing is part of the route along the east coast of Scotland linking the Black Isle at Cromarty and then from Chanonry Point to near Fort George. Dunskeath Castle (MHG8444) was an early Motte & Bailey fortification built on the hillside above Nigg to control the ferry crossing. In 1179 both Dunskeath and Ethendour (Eddyrdor or Redcastle) situated at the head of the Beauly Firth, were fortified by King William the Lion. There is a record from 1290 of two English agents on their way to Orkney travelling in one day from Nairn to Cromarty using this route. The Village of Milton: A Potted History: Miltoun developed as the ‘mill town’ of the estate of New Tarbat. It is present on the Blau map, 1654. Munro lairds built a castle near Milton around 1500 AD which was destroyed by fire in 1642. George Mackenzie began New Tarbat House in 1670 and this was replaced by Tarbat House (ruined) 1784-87. George Mackenzie became hereditary sheriff and held courts at New Tarbat House. He also made Milton a ‘burgh of barony’ with weekly cattle markets around the mercat cross. Many buildings around the market place were built in the late 18th century and early 19th century including the Drovers Inn (now council flats) and possibly the toll house. The stone ball on the mercat cross is dated 1799 but the remainder is earlier. 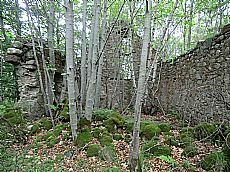 There is also a mill, miller’s house and a mill lade that can be traced in the woods. Milton has a varied and significant past, being the seat of power in the region for a period, then later a thriving economic centre. Routeways linking this region with wider Easter Ross would have played an important part in the development of this site. The route from the Beauly Firth to Tain can now be viewed as a separate record on the HER here. 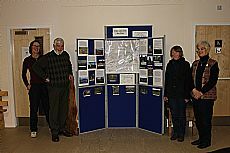 Proud participants with the final display at the Milton Mercat Centre. Email Cathy at cathy@archhighland.org.uk or phone 01348 868 230 for more details.